Follow your guide and enjoy the best of Normandy and Lore Valley in this 4 days trip experience. 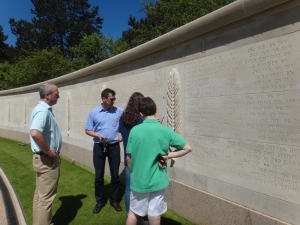 The purpose of this tour is to re-live the principal events and battles of the Longest Day, explore the Wonder of the West, the Mont Saint-Michel and discover the most beautiful castles on the Loire Valley. Have fun ! 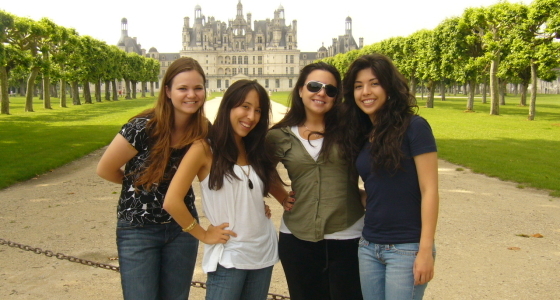 4 Days in Normandy and Loire Valley !!! Your Licensed English Speaking Guide will pick you up from your hotel in Paris at 7.00 am in a deluxe private vehicle and you will depart immediately to the wonderful region of Normandy. 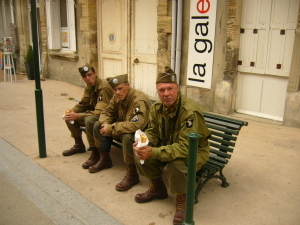 Upon your arrival, you will be given an introduction by your private guide to the battle of Normandy. The itinerary on this private tour is flexible, however all entrance fees are at your own expense. Hotel and meals are not included. Following this, you will have a lunch in a traditional restaurant in Port-en-Bessin, a small fishing-port village, situated between Omaha Beach and Gold Beach. Enjoy some of the best specialities of Normandy region: fresh sea‐food, Camembert cheese with some great local cider. BON APPETIT ! 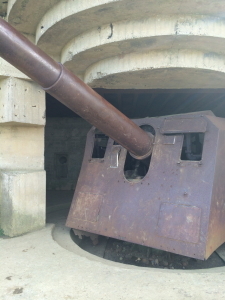 After this delicious lunch, you will discover another impressive site of the Second World War : the German Battery of Longues-sur-Mer, part of Germany’s Atlantic Wall coastal fortifications with the four 155mm guns still intact. 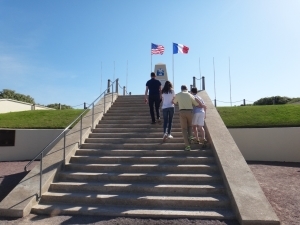 At the conclusion of your tour, you will visit the beautiful town of Arromanches where the massive artificial harbour built by the Allies still remains, before reaching your hotel in Bayeux. After a delicious lunch, it is now time to enjoy a walk in the sand at Utah Beach where the first American troops landed on June 6, 1944 under orders of General Barton and General T.Roosevelt, Jr in the first attack wave. Utah Beach was the furthest west of the five beaches designated for the D-Day landings in June 1944. Located at the base of the Cotentin peninsula, it was added by General D.Eisenhower to the original D-Day plan to ensure the early capture of the vital port of Cherbourg, at the north of the peninsula. Then, you will enjoy a private visit of the Utah Beach Museum. It recounts the story of D-Day in 10 sequences, from the preparation of the landing, to the final outcome and success. This comprehensive chronological journey immerses visitors in the history of the landing through a rich collection of objects, vehicles, materials, and oral histories. 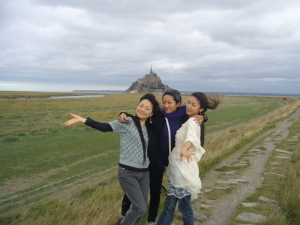 Time to reach the Mont Saint-Michel. Enjoy the scenery whilst driving to the Mont Saint-Michel located in Normandy, just at the gates of the Brittany region where you will spend your second night. 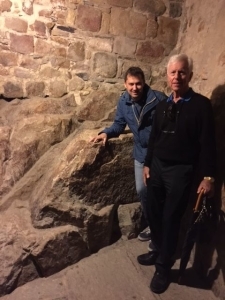 Before reaching the famous bay, you will be given an introduction by your private guide about the history of the Mont Saint-Michel. Due to its uniqueness, the Mont can be recognised from every side. One of France’s most recognisable landmarks, Mont Saint-Michel and its bay are part of the UNESCO list of World Heritage Sites. Following this, you will have a typical lunch in a traditional restaurant. The Mont Saint-Michel is famous for its restaurants which serve traditional omelette, leg of lamb and local specialities of fish and seafood from the Bay. 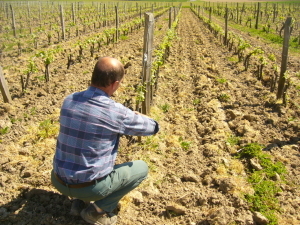 After lunch, you will depart immediately to the wonderful region of the Loire Valley. Upon your arrival, you will be given an introduction by your private guide to the history and geography of the region (all our guides are equipped with the appropriate maps, photos and documents for better explanations) With its 800 sqkm, the Vall de Loire is actually the largest site to be listed by UNESCO. 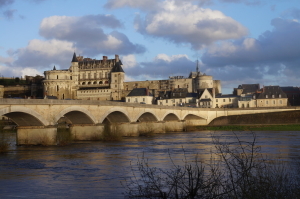 Enjoy the scenery whilst driving to the medieval town of Amboise located in the Loire Valley where you will spend your last night before heading back to Paris. 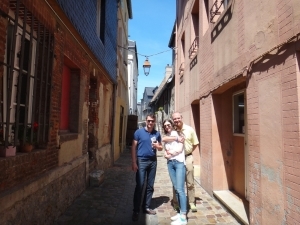 Before reaching Amboise, you will be given an introduction by your private guide about the history of the Loire Valley. In accordance with your wishes, we will give you good advices and we will help you to book the best hotel in the right place to make your trip unforgettable. You will have time to relax and get lost in the medieval town of Amboise, with its narrow streets and half-timbered old houses. Night in Amboise. You will begin your last day with the visit of the Château of Amboise. This castle will amaze you with its elegant gardens, its medieval and renaissance architecture, added to the breathtaking view of the ‘Royal River’. Thanks to your guide, you will learn about the history of the Château (it was a place to live and stay for all the Valois and Bourbons Kings) and discover the St Hubert Chapel famed as a resting place of Leonardo da Vinci, who died in Amboise on the 2nd of May, 1519. Then, you will visit your second castle of the morning : Chenonceau known as ‘the Ladies Castle’ because it is related to important French Rennaissance women (Diane de Poitiers, Catherine de Medicis…). 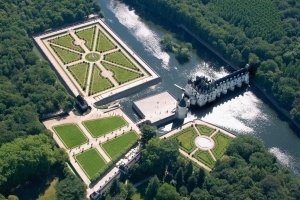 The unique architecture of the castle, with the gallery over the River Cher makes it one of the most original Chateaux of the Loire Valley and definitely the most romantic of all. 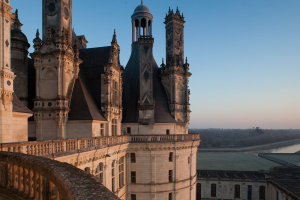 After this wine tasting, enjoy the scenery whilst driving along the Loire River to reach the most impressive and extravagant castle of the Loire : Chambord, with its 77 staircases, 282 fireplaces and 426 rooms. Despite these vast dimensions, from the outside the Château still appears delightfully graceful and well-balanced. 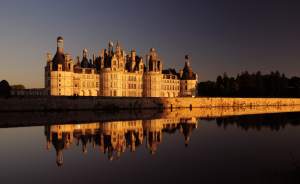 Chambord, built to be a hunting lodge and used exclusively as a hunting lodge, was ordered by François I to Leornardo da Vinci and his architects. After this delightful and enjoyable day, you will be dropped off at your hotel in Paris around 7.00 pm.